Chocolate candy making is truly a pleasure that everyone needs to experience at some point in their life. Not only will you be thrilled at what you can make, you will also treasure the way your friends and loved ones savor that delicious homemade taste. Taking the time to make chocolate candy from scratch is a way for me to show my family that I think they are special. Making homemade chocolate candy isn't rocket science, but DO be sure to read the candy making tips and secrets that we've provided before you get started. This will help you ensure that your homemade chocolate candy making attempt is a delight rather than a disaster. I've made plenty of blunders myself over the years, so don't be discouraged if you don't get the exact results you'd imagined the first time around. One thing I can honestly say, I didn't mind eating my mistakes! 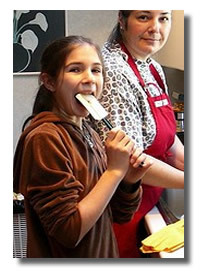 Some of my fondest memories of childhood were those made in the kitchen creating sweet treats with my mother. 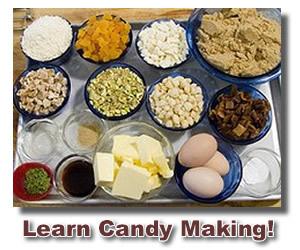 Enjoy the experience of candy making with your children by using it to build memories and share lots of giggles. Like me, when they grow up, a particular aroma will put a smile on their face and flood their mind with memories of home. You could also be very subtle and guide them into learning more about measurements and temperatures in the process! 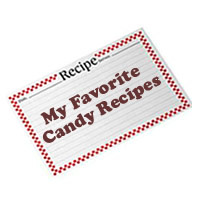 Experiment with some of these wonderful homemade chocolate candy recipes. Once you get the hang of it, you may develop some new ones of your own. If you do, be sure to share them with me or read some given by other visitors. I can never seem to get enough! Use Chocolate Candy Molds For Extra Fun! 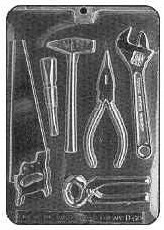 Chocolate candy making molds are a fairly simple way to make treats for special occasions. Once you have the chocolate and the molds, you are halfway done. Depending on how creative you want to get you can really jazz them up with food coloring or candy paint. You can find molds like these at Candyland Crafts who carry over 2000 different molds. If you are a novice at making homemade chocolate candy, don't worry. You can start out with just the basics. You don't have to spend a fortune on gourmet chocolate and all the trimmings. Just pick up your ingredients at your local grocers and give it a try. Before you get started with your homemade chocolate candy making, visit my candy making supplies page to give you an idea of the kind of items you may already have or what you might want to look into getting. You'll be surprised to find out how much fun you'll have. You may even get hooked! Don't say I didn't warn you.